Kindasophically speaking: How safe is your favourite bottle? How safe is your favourite bottle? About 22 years or so ago, soft drink manufacturers started replacing their large glass bottles with lightweight, and hip-looking plastic bottles. These PET bottles quickly gained public acceptance and was soon seen in every supermarket shelf. Along the way, some smart guy figured that these nifty bottles would make cheap and perfectly practical water bottles, in place of the much more expensive Tupperware bottles. Before you knew it every other student was toting a PET bottle. Some manufacturers even made straps so you can fasten onto these bottles and make carrying these around easier. Fast forward 10 years later, and the public started warming up to the idea of drinking mineral or filtered water out of bottles as well. These were also made of PET, and soon replaced soft drink bottles as the 'even hipper' water bottle. By now, you'd have to have been hiding under a rock this past decade if you don't already know that re-using PET bottles for all drinking liquids is a big NO-NO. Studies indicate these bottles may leach DEHP into the water. DECP is a suspected cancer-causing chemical. Of course it all depends on which side of the story you hear. PET manufacturers' FAQs will say this is a load of baloney. And some people will tell you if you listen to every warning, you won't even be able to breath, let alone live to the next day. Go figure! Back to our history lesson. 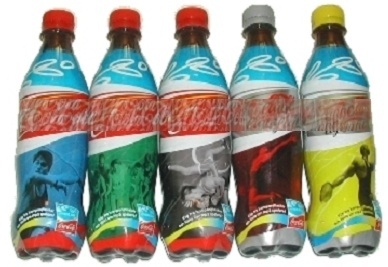 About 5 years or so ago, along came a new wonder bottle, made of polycarbonate (PC for short). These were touted to be the perfect medium for water bottles -- they were very tough, durable, looked pleasant, were recyclable, heat resistant, odour-free, and most importantly, perfectly safe. Most, if not all of us, fearing for our health, ditched our PET bottles in favour this new, 'space age' bottles in an instant! The considerable take-up factor was also aided by the fact that for all its benefits, these bottles were still much cheaper than Tupperware! PC is a really versatile plastic. It is actually clearer than glass and can transmit light better. Because of these qualities, it is used to make high-end reading lenses. This stuff is also used for making CDs and DVDs. You find them in baby feeding bottles, tough plastic appliances, car head- and brakelights, skylights, display cabinets, ... the list just goes on! With so many wonderful uses, you'd imagine you can't go wrong with this stuff! Unfortunately, recent studies have found that with regular use, PC can leach BPA (bisphenol A), a hormone messer-upper. Some studies link it to breast and ovarian cancer, while others warn against dangers to infants. So how do you identify which bottles are safe? 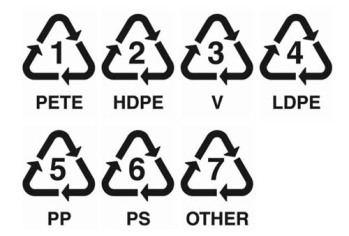 The trick is to look at the bottom of plastic ware, for the triangular recycle signs. So far, plastics with the number 2, 4 and 5 have yet to be reported to be dangerous or known to have caused any harmful effects. So your safest bet is to go with plastic products with these numbers. To be fair, PC bottle makers like Nalgene have come up with BPA free PC bottles now. Similarly, you can also find BPA-free baby feeding bottles in the market -- you just to be on a look out for these products. Forestgrovelive.com has published this simple reference card that you can easily use as a guide. It doesn't specifically pick PET out as a danger, but like I said, there are lots of people have either support or reject this.... so its your choice! I live Tupperware and swear by Tupperware. The rest is just no-ware. Haha, WLE, so now, I'm a-ware of that as well! That's a nice write up! Thank you for sharing. It seems like plastic is not so safe after all. How about changing to glass? LOL It will be heavy and dangerous then..
Sony Ericsson Xperia X1 - launching!! Digital Photography - it just gets better! What is everything in the Universe made of?